I selected this as my Book of the Month, although that is not to say that I did not have some problems with it. 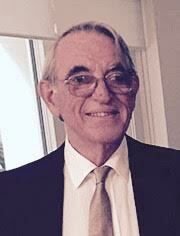 Dr. Volandes is a physician at Harvard Medical School who has spent an enormous amount of time and effort developing an educational video to help patients and families choose care, at such time as they are seriously ill or come to the end of life, that is both what they want and clinically appropriate. 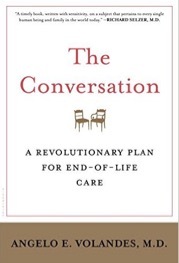 The first few chapters include the stories of a number of patients who, for differing reasons, received end-of-life care that was inappropriate, or care that was just plain awful. The poetry professor with terminal glioblastoma multiforme who elected to go home (on steroids) for her last few days (instead of staying in hospital where she would have had a zillion tests, perhaps a bit of mannitol, and probably some futile CPR (cardiopulmonary resuscitation)) is described as choosing ‘to cut short her medical treatment’; the only thing she cut short was a whole lot of useless medical interference. He correctly points out Hollywood’s lies about CPR; in Hollywood, 75 percent of people survive CPR, but in the real world only 10 of 69 patients with advanced cancer survived CPR, after which they survived an average of three hours, none regained consciousness, and none left hospital alive. He also points his finger at the doctors, including himself, who are unable or unwilling to have an honest discussion about what may or can happen in words that the patient and family can understand. Buoyed by his experience with the poetry professor, who accidentally witnessed CPR being performed on a 90-year old woman with disseminated cancer (how inappropriate and futile is that?) in the course of a tour of the ICU (intensive care unit), Volandes embarked on a program of ICU tours. He would take potentially terminally ill patients and their relatives down the centre of the ICU, usually during the night, presumably discussing the highlights as they went. He claims that this was the only means to enable ordinary people to understand the matters about which they should be making choices. To me, this says that his communication skills were zero (which they were not) or he was unwilling to make the effort, or to learn how to do the ‘hard yards’. Having a deep and meaningful conversation with a patient, in words they can understand, and including death and dying, are part of the job. He backs his arguments with some chatter about conversations only leading to patient passivity and disempowerment, but I don’t buy it. And there are a number of compelling reasons why his ICU tours should have been regarded as unacceptable, none of which apparently occurred to Volandes. However, they occurred to the nurses, who shut his tours down. Hooray for the ICU nurses! So, well over half way through the text, we come to the making of the educational video that is meant to have a major impact on end-of-life care. It sounds as though it took an awful lot of time and research, a lot of trial and error, endless editing, and a lot of perseverance, to all of which I pay homage. I was not able to access the video, but by his description it demonstrates the three main streams of care – everything (including ICU, breathing tubes and CPR), comfort care, and everything else that was described as ‘somewhere in between’. It encourages people to think about what is special to them in terms of living, to think about future choices, to talk to their loved ones and family, and to talk to their medical team. These are all positive steps, but I was unable to see how it would fix the problem that exists. The patient still needs the doctor to tell them where they are at medically and that they may die in the foreseeable future. For doctors who are unwilling or unable to have an end-of-life conversation under normal circumstances, being confronted by an empowered patient who has watched the video may lead to even worse outcomes. In addition, the video (which I have not seen) must be general and only some of the information will be relevant to any particular patient’s individual circumstances. I was left feeling a little ambivalent. On the one hand (and all my whingeing aside), anything that encourages and enables patients to think about these things, let alone complete advance directives and living wills, should be regarded as good. But I do not see it having any material effect on the doctor’s inability to communicate clearly and honestly (or communicate at all). The text is meant to be directed to the patient, but some of the time it sounded as if he were justifying methodology to his colleagues, and I thought some of the case histories sounded a little melodramatic. And the boast that patients with advanced cancer were less likely to want CPR after they had seen the video (50 percent down to 20 percent) was lost on me; do one-fifth of the patients with advanced cancer, counseled about the realities of end-of-life care, want to go ahead with a procedure that they have been told is of no benefit, i.e. it is futile? This book is definitely a step in the right direction, but there are other issues (the doctors, for one) that need to be addressed. This is a nicely written description of dementia for healthcare professionals. The contributors are, with one exception, from the psychiatric faculties associated with the Johns Hopkins University School of Medicine. The opening chapters discuss what dementia is, the many and varied causes, and how to go about the baseline assessment and diagnosis. There is an overview of dementia care as well as separate chapters on supportive care (for both the patient and the family/carers), disease-specific therapies, and the management of neuropsychiatric symptoms. The last two chapters are about caring for people with advanced dementia, and a discussion of the ethical and legal issues involved. I liked this book, which I thought provided a reasonably detailed account but in a clear and understandable way. If the unit for which you work cares for more than an occasional patient with dementia, this would be a useful volume to have on the library shelf, particularly for new members of staff. 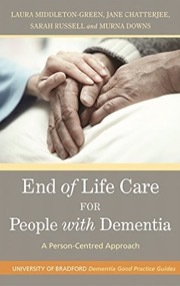 By pure coincidence, a second book about dementia care arrived on my desk at the same time: End of Life Care for People with Dementia by Middleton-Green et al (see separate review). Looking at the books together, I was relieved to see they were, in fact, focused on different aspects of care (and which meant I did not have to step up and say which was better). Rabins et al is about managing people living with dementia, whilst Middleton-Green et al is more focused on the management of people with dementia who are dying. As such, the two books complement each other. 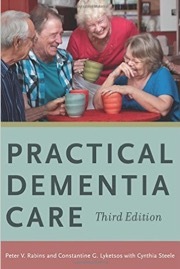 This book is part of the University of Bradford School of Dementia Studies’ Dementia Good Practice Guides. The first chapter is about Transitions, which provides some overview of the whole course of dementia, and particularly that to the end of life. There are chapters on the Physical Wellbeing and Dignity and on Emotional Wellbeing and Dignity. These are followed by chapters on Supporting Families and Supporting the Professional Carers. Leafing through the book, the text seemed reasonably comprehensive and was augmented by the liberal use of headings, lists and illustrative case studies. By pure coincidence, a second book about dementia care arrived on my desk at the same time: Practical Dementia Care by Rabins et al (see separate review). Looking at the books together, I was relieved to see they were, in fact, focused on different aspects of care (and which meant I did not have to step up and say which was better). Rabins et al is about managing people living with dementia, whilst Middleton-Green et al is more focused on the management of people with dementia who are dying. As such, the two books complement each other. I have never gone looking for any of the (presumably numerous) self-help books dealing with all the problems lumped together as ageing and old age, and was not sure what to think when this book appeared from beneath the Christmas tree. Deposed by Julius Caesar, twice divorced, and having lost his beloved daughter Tullia, Cicero retreated to his country estate where he turned his hand to writing. In the same year that Caesar was murdered, 44 BC, he wrote a short treatise De Senectute (‘On Old Age’), here presented in a new translation. 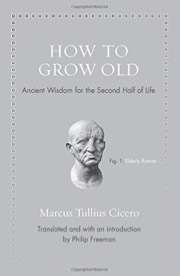 In a dialogue between the respected elder, Cato, and two younger men, Cicero focuses on the four reasons why people consider old age so miserable – it denies us an active life, it weakens the body, it deprives us of almost all sensual pleasures, and because it is not far from death. Addressing these issues, and a whole lot more along the way, Cicero shows why and how the second part of your life can be the best. There is a timeless wisdom to what is said – it is about the body and the mind, and the ceaseless clamor of modern society is absent. The French philosopher, Michel de Montaigne, is reported to have said the book ‘gives one an appetite for growing old’. So who is this book for? Our ageing patients? If they’re interested, they will probably get more from this slim book than they would from a modern encyclopedic self-help manual that sets out to cure everything. Ageing palliative care professionals? I certainly enjoyed reading it. And younger palliative care professionals? Yes, because it may assist them in dealing with the whole business of death and dying and because, as Cicero says, the foundations for an admirable old age must be well laid in youth.